If you had flipped open the Lifestyle section of the Sunday Times last Sunday, you would most probably have seen this. The article touched on 'Sharenting' - how today's parents are putting information and pictures of their children online be it on blogs, Facebook, Twitter or other forms of social media and more importantly, how parents balance the need to share or impart knowledge with the need for security. Perhaps due to my previous stint as a panel speaker for the recently concluded Social Media Week's 'Growing Up on Facebook' session, I was approached by Sunday Times to share my thoughts on the topic. And I gladly obliged. The news article had predominantly focused on Ayd's fall into his school pond, and his aftermath reaction. But in fact, I was quizzed on a far wider range of questions but given how space in newspapers is a premium, I understand not everything can be used. Your wife started the blog when your eldest son Ash was born in 2005. Why have you both kept it alive all this while? At that time when my eldest son was born, we started a blog as a means to document the growing years of our children. We wanted something that we could go back and read about all the wonderful experiences that we have accomplished together as a family... after all our kids have grown up and become independent. Truth is, I write my blog posts at night when all my kids have gone to bed so it has become a somewhat therapeutic ritual for me which I have not grown tired of. Who is the blog for primarily? For example, the section on Kids Activities -- what is the main purpose of it? As with all other family blogs, our blog started out with the sole purpose of being an online diary for my family and our relatives and friends. We have a few relatives overseas and they find great joy in keeping tabs on the growing up years of our 3 kids. That said, over the past 8 years our blog has slowly evolved to one which serve to share kids-related ideas and activities with fellow parents. I have often heard how some parents lament that Singapore is boring for kids, and that they are unable to think of any kids-friendly activities or places to go to whenever the weekend rolls by. But that's just a myth - at least in my eyes. There are tons of stuff to do and go in Singapore, if you know where to look. And that's where the sharing through my blog comes in so hopefully, we are able to inspire other parents to embark on an exploring and bonding journey with their kids too. And I believe that our blog is making a difference - I have had friends' colleagues and strangers come up to me telling me that they go to my blog whenever they run out of ideas of where to bring their kids during the weekends or school holidays. Are you concerned that with the pictures, names and details of your children's likes and dislikes - that someone with bad intentions may use it for bad purposes (eg extort money)? With the proliferation of technology, nothing is private anymore. I believe that if someone has the deliberate ill intention to cause harm to another, he/she will be able to dig up any information regardless of whether it is made online. At the other end of the spectrum though, I am also mindful of sharing their entire lives online for all to gawk. So I do not post information like the names of schools or enrichment classes on my social media platforms. When does giving information become "oversharenting"? How do you balance the two? I think the issue of 'oversharenting' occurs when a parent blasts off information about their kids relentlessly and without giving it much thought. This can come in the form of sharing photos of one's baby's poop or posting about a naughty incident that his/her kid had done with the intention of shaming the child. I feel it is important that we as parents take a step back sometimes and think if certain things that we upload online will have a detrimental effect on our kids at a later part in their lives. So it is often a thin line to thread when it comes to sharing our photos and status updates on the various social media platforms. But when it comes to technology, one thing is for certain - our children cannot afford to fear technology. Banning social media from children until they are deemed old enough, or even parents shunning the use of such platforms can be counter-productive to a child’s development. Like it or not, the ways that people interact and make friends are changing. It is here to stay. We cannot simply afford to pull a blanket over our children's heads and hope that they will suddenly become savvy social networkers, nor can they be thrown in to the likes of Facebook or Twitter. Education is the key, and they should not merely be told that. They need to be gradually introduced to social networks and trained on how to use them safely. For both my boys, they are now old enough to understand the simple concepts behind an online blog as well as the notion of how the entire world can read whatever I publish on my blog. So now, I usually include them when I am in the middle of drafting a blog entry and let them read whatever I post. In this way, I hope to inculcate in them in taking responsibility of what one posts online, and also the amount of information shared. I would rather be the one who exposes them to the world of social media and guide them along as they grow older, than let them learn about the workings of social media through their friends. So hopefully, with the right nurturing, guidance and practice, my kids will have the best possible preparation when they are deemed old enough to tackle social media on their own and at the same time, I have been involved long enough so as to be constantly aware of their actions online. 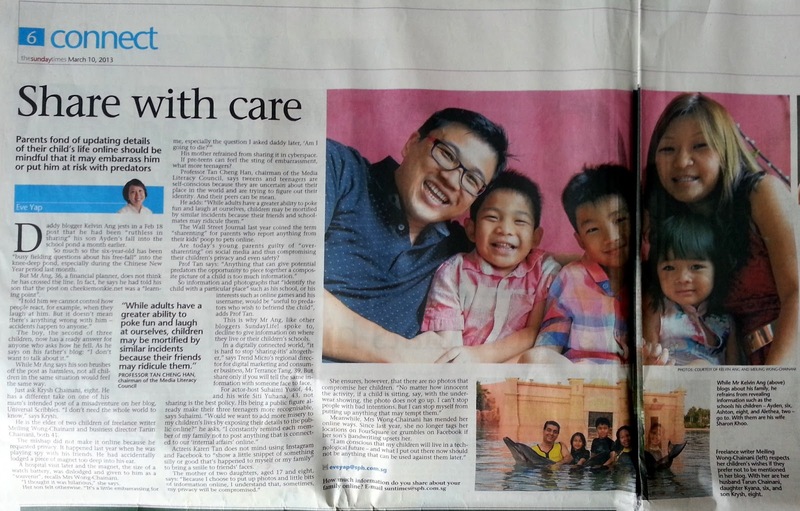 In other news, the wifey exclaimed that our photo in the article was "freaking HUGE!" And in case you are wondering, Part 1 is here.